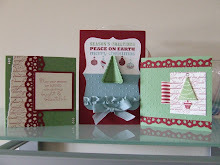 I've been trying to make some more leafy cards this evening and this is what I came up with. They're a bit samey though! I inked the whole set of stamps and stamped straight onto the card both times with Stormy Sky Distress Inks. I have some more ideas so maybe I'll get time to try them out tomorrow. Two lovely cards kat. I love all the Blue shades. I love the muted look on the stamping.